Type “Sun Wukong” into google images and you will be presented with an endless array of pictures that range from the familiar to the alien. A fanciful 1960s cartoon depiction of our hero sits to the left of a SMITE video game character with hulking muscles and a weapon more akin to a club than a staff. A toy version of Liu Xiao Ling Tong‘s much beloved 1986 TV portrayal sits above an anime character with blond hair and a shaved chest. 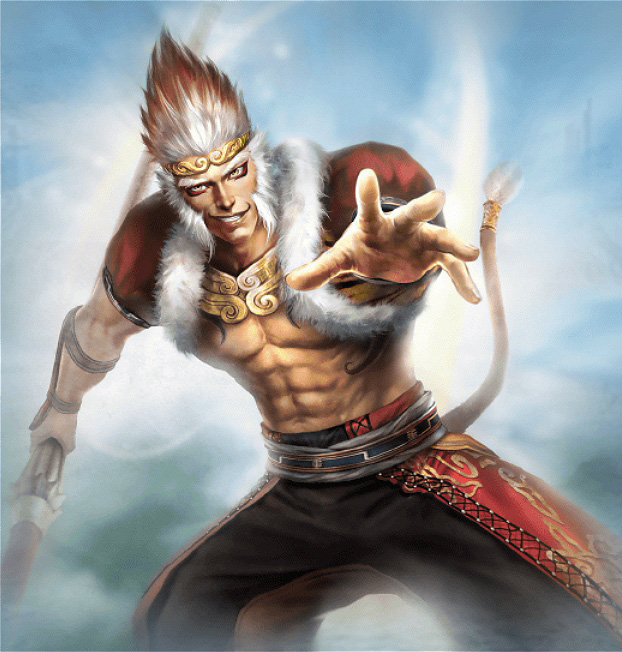 It seems there are as many depictions of Wukong as he has transformations. But how do these myriad personas compare to his depiction in the novel, and who has produced the most authentic look? 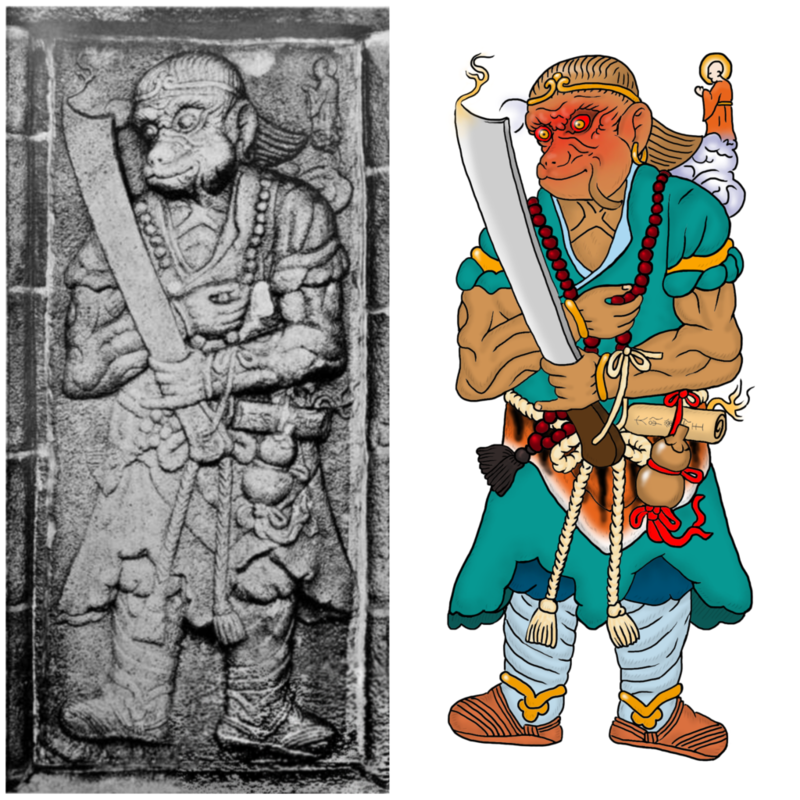 In this article I present the Monkey King’s literary description, along with ancient depictions that predate the novel. My hope is that the information will be both interesting and useful, especially for artists and cosplayers looking to make a more authentic design. Some may be surprised to learn that stories about a “Monkey Pilgrim” (Hou xingzhe, 猴行者) go all the way back to the Song Dynasty (960-1279). This predates the actual name Sun Wukong by centuries. The literary episodes we all know and love began life as oral tales that evolved over time and grew into an accepted storytelling cycle which started to solidify by the 15th-century. But the further we go back in time the less familiar the recorded material becomes (I will return to this shortly), and due to the memory-based nature of oral storytelling,  records for the earliest repertoires do not exist. 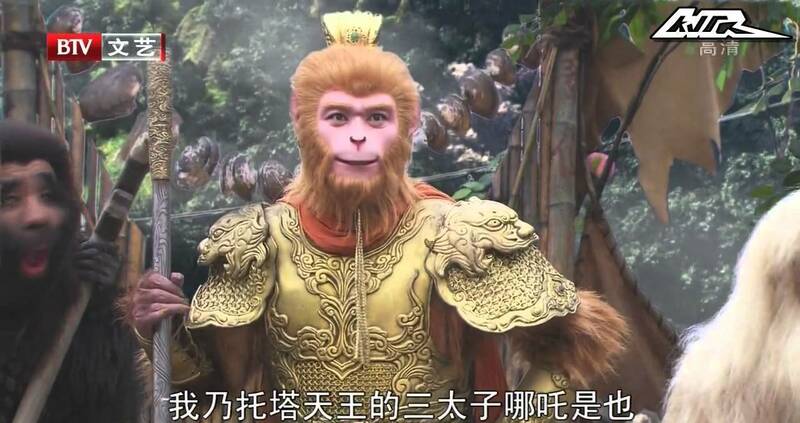 Luckily, visual media from the Song survives, allowing us to see how artists of that time depicted the Monkey King. 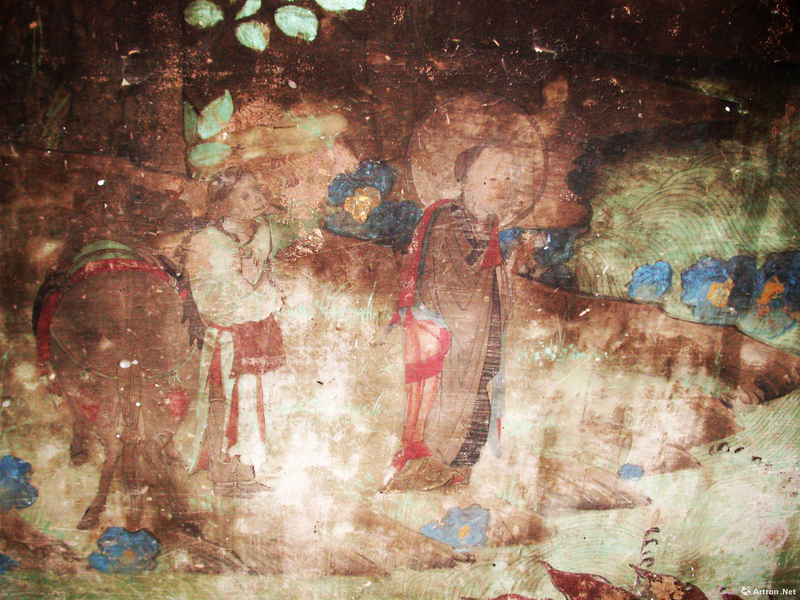 Eastern Thousand Buddha Cave (Dong qianfo dong, 東千佛洞) number two in the Hexi Corridor of Gansu Province contains an 11th-century (Xixia dynasty) wall painting of Xuanzang worshiping Guanyin from a riverbank, while Monkey stands behind him tending to a brown horse. The latter is portrayed with a plain circlet on his head, a homely face with an overbite, waist length hair (or possibly even wearing a fur on his back), and light blue-green robes with a red apron and brown pants and sandals (fig. 1 and 2). The depiction is less simian in appearance, yet not wholly human. Fig. 1 – An almost complete version of the Eastern Thousand Buddha Cave no. 2 painting (larger version). A detail of Monkey and Xuanzang (larger version). Yulin Cave (Yulin ku, 榆林窟) number three in Gansu contains an 11th to 12th-century wall painting with similar imagery. 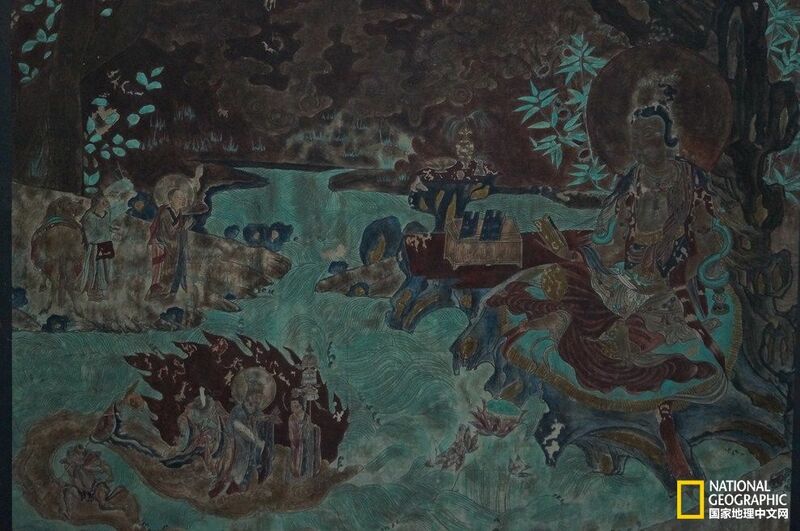 Xuanzang is again worshiping from a riverbank, but this time the subject of adoration is Samantabhadra. We see Monkey lacks the fillet but wears a monk’s robe with wrapped socks and sandals. This time he is far more monkey-like in appearance, complete with furry arms (fig. 3 and 4). Fig. 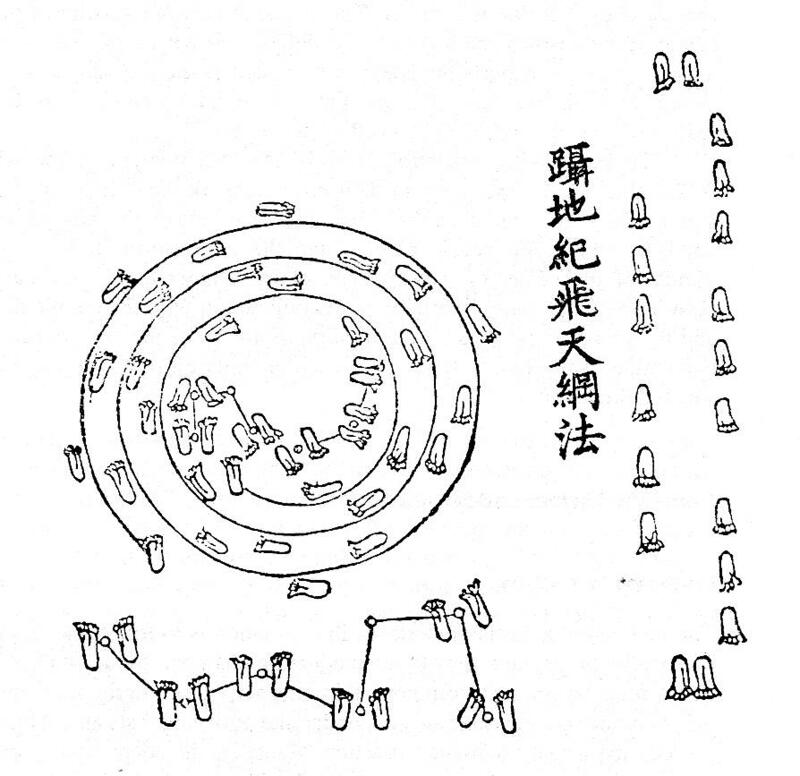 2 – An almost complete version of the 11th to 12th-century Yulin Cave no. 3 painting (larger version). 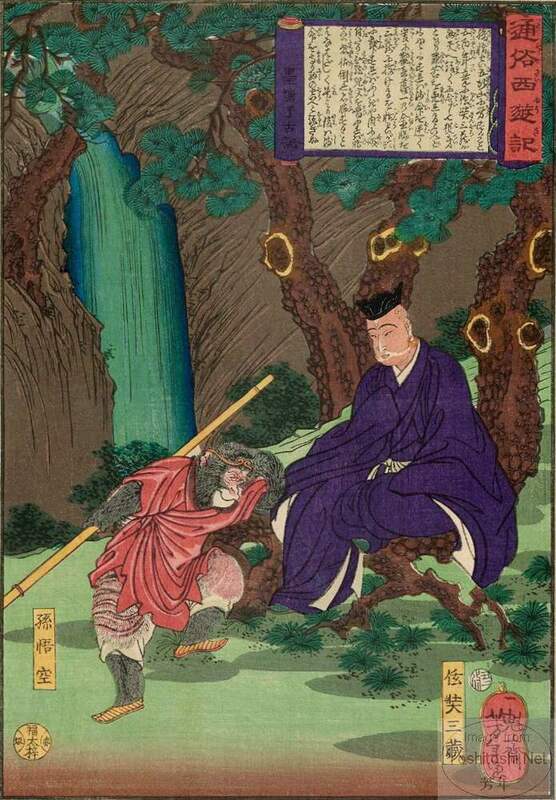 Monkey and Xuanzang can be seen standing on the river bank on the upper left side. Fig. 3 – A detail of the two figures (larger version). Despite the lack of written evidence from this time, the fact that the Monkey Pilgrim appears in picture form in two noted Buddhist cave grottoes shows the story was well known as early as the 11th-century. It’s not impossible to imagine that the oral tales go back further to the previous century or even before the Song itself. A circa 1237 stone relief carving of what many scholars believe to be an early version of Monkey resides on the western pagoda of the Kaiyuan Temple (開元寺) in Quanzhou, Fujian province. This muscular warrior wears the headband, earrings, bracelets, a rosary necklace, and possibly even arm bangles (all prescribed Esoteric Buddhist ritual accoutrements), as well as a monk’s robe and sandals. He wields a broadsword in one hand, while the other thumbs the rosary at his chest. 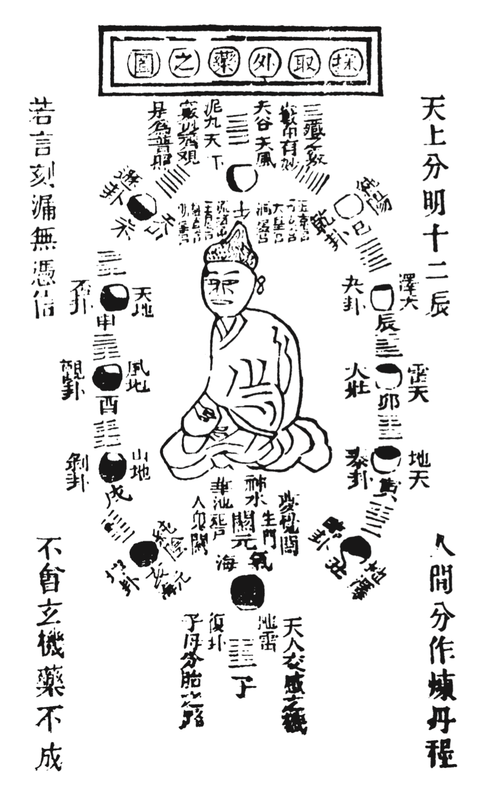 At his waist hangs a calabash gourd and a scroll of the Mahamayurividyarajni Sutra (Fomu da kongque mingwang jing 佛母大孔雀明王經) (fig. 5) (Ecke & Demiéville, 1935). He has the large ears and protruding mouth of a monkey. Fig. 5 – The monkey-headed warrior from Kaiyuan temple in Quanzhou, Fujian (larger version). Ugliness is a subject I will return to several more times. I mentioned earlier that the farther we go back in time the less familiar the recorded material becomes. 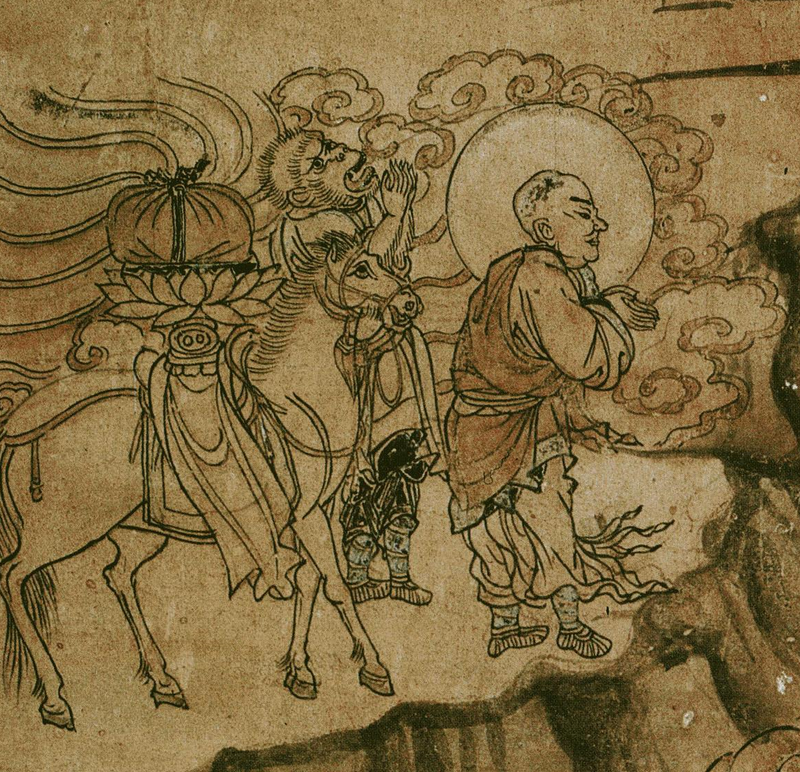 Case in point is the Master of the Law, Tripitaka of the Great Tang, Procures the Scriptures (13th-century), the earliest published edition of Journey to the West. Despite referring to himself as “the bronze-headed, iron-browed king of the eighty-four thousand monkeys of the Purple Cloud Grotto on the Mountain of Flowers and Fruit” (Wivell, 1994, p. 1182), the Monkey Pilgrim is depicted as a white-clad scholar. Another difference is the fact that he fights with two different staves, one a ringed monk’s staff and the other an iron rod (these two would later be combined to create his familiar weapon). The majority of Song sources depict the Monkey Pilgrim as the size of an adult man but with the head of an ugly monkey. Reasons for why he is depicted as such could be because the respective artists lived in areas devoid of such animal examples, or that they simply imagined a monk like themselves (for the artists were likely ordained) with monkey features. Another reason could be that they were influenced by early stage portrayals, which would obviously entail an adult actor taking on the role. The earliest descriptions of what Monkey looks like appear in chapter one. When he is first taken in by his teacher Subhuti, the immortal tells him, “Though your features are not the most attractive, you do resemble a pignolia-eating macaque [husun, 猢猻].”  The macaques are a genus of Old World monkeys endemic to Asia. 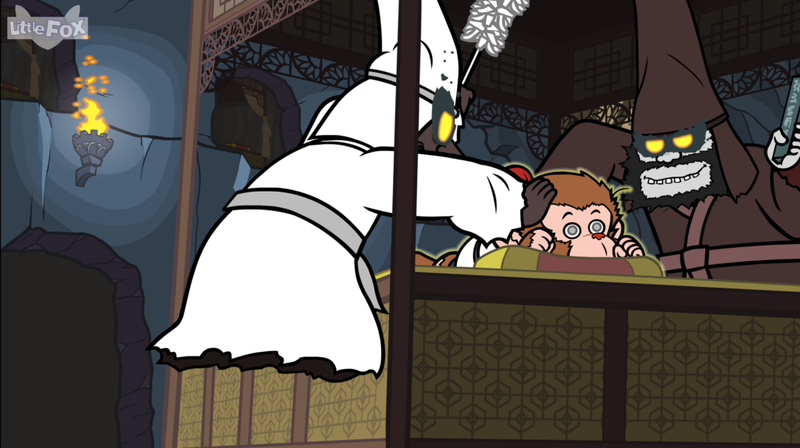 Later, a demon king refers to Monkey’s height: “You’re not four feet tall” (Wu & Yu, 2012, vol. 1, p. 128). 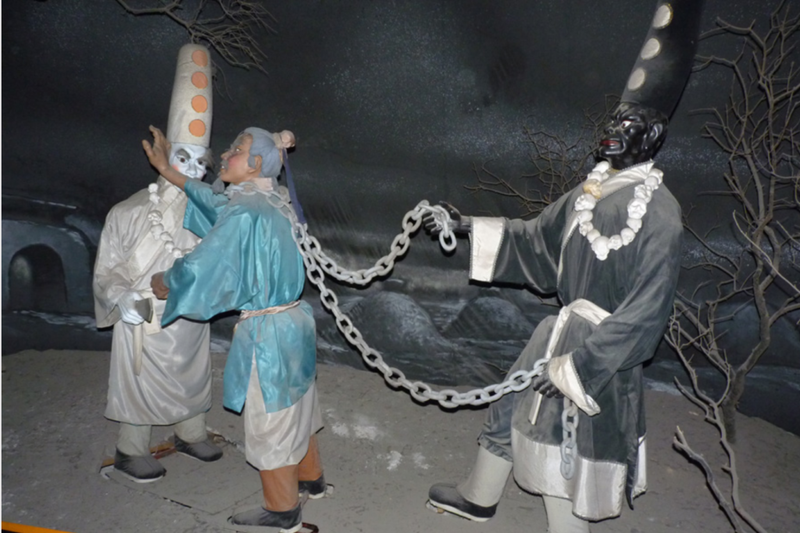 In chapter 7, Monkey is subjected to Laozi’s eight trigrams furnace as punishment for his crimes against heaven. He survives the celestial fire but the smoke inside “…reddened his eyes, giving them a permanently inflamed condition. Hence they were sometimes called Fiery Eyes and Diamond Pupils [Huoyan jinjing, 火眼金睛] (Wu & Yu, 2012, vol. 1, p. 189). The anthropologist Frances D. Burton (2005) explains his fiery eyes are “a characteristic he shares with the actual red-rimmed eyes of [the Rhesus macaque (Macaca mulatta)]” (fig. 6) (p. 148). Fig. 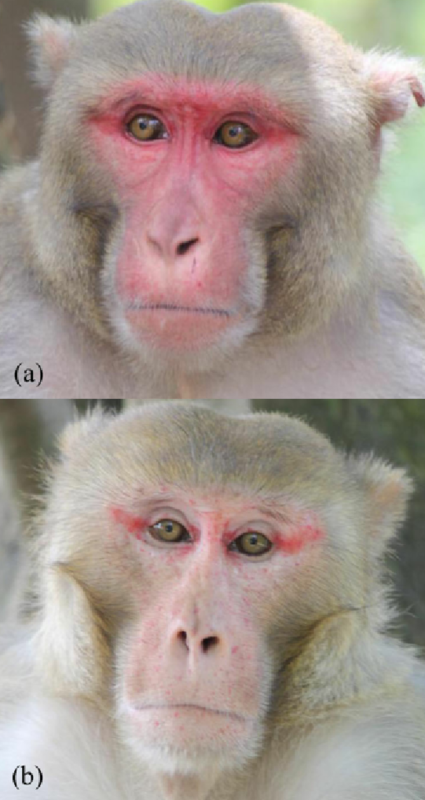 6 – A comparison of Rhesus macaque males with red-rimmed eyes during mating season (top) and other times (bottom) (larger version). Fig. 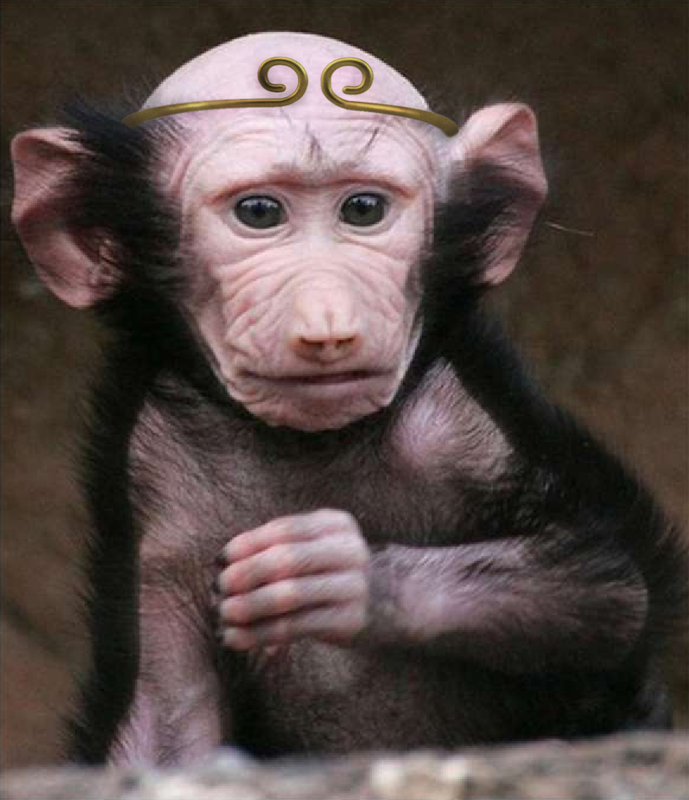 7 – A baby baboon with a bald head. Look at those ears! It’s the wrong species but you get the general idea what Sun Wukong would look like wearing the golden fillet (larger version). His bald head is referred to again in chapter 34: “The fiend then gave the rope a tug and pulled Pilgrim down before he gave that bald head seven or eight blows with the sword. The skin on Pilgrim’s head did not even redden at all” (Wu & Yu, 2012, vol. 2, p. 128). He looks more strange than [the] thunder god (Wu & Yu, 2012, vol. 2, p. 276). In chapter 49, a monster who barely survived a battle with Sun Wukong describes his appearance to a friend: [H]e has a hairy face and a thunder god beak … forked ears and broken nose. A monk with fiery eyes and diamond pupils (Wu & Yu, 2012, vol. 2, p. 353). And fangs that have outward grown (Wu & Yu, 2012, vol. 3, p. 105). “‘If your bald head can withstand three blows of my scimitar, I’ll let you and your Tang monk go past’ … Arousing his spirit, the old demon stood firmly with one foot placed in front of the other. He lifted up his scimitar with both hands and brought it down hard on the head of the Great Sage. Our Great Sage, however, jerked his head upward to meet the blow. All they heard was a loud crack, but the skin on the head did not even redden” (Wu & Yu, 2012, vol. 3, p. 373). You! look at your skeleton face, flattened brow, collapsed nose, jutting jowl, and hairy eyes. A consumptive ghost, no doubt, and yet without any manners at all, you dare use your pointed mouth to offend an elderly person like me!” (Wu & Yu, 2012, vol. 3, p. 242). We can see from these quotes several features that appear again and again. These include a furry, joweless face with fiery eyes, a broken/flat nose, a beak-like mouth with protruding fangs, and forked ears. The author/compiler of the novel uses these features over and over again to remind the reader just how ugly the Great Sage is. These same features are also shared by the Rhesus monkey and other macaque species (fig. 8). The multiple mentions of the Thunder God‘s beak refers to the monkey’s prognathic (protruding) mouth, which houses large canine teeth. The quotes also let us know that Sun Wukong is less than four feet tall and very skinny (e.g., having “sallow cheeks” and being like “a consumptive ghost”), just like a monkey (fig. 9). It’s important to note that Sun is described as being bald numerous times throughout the novel. 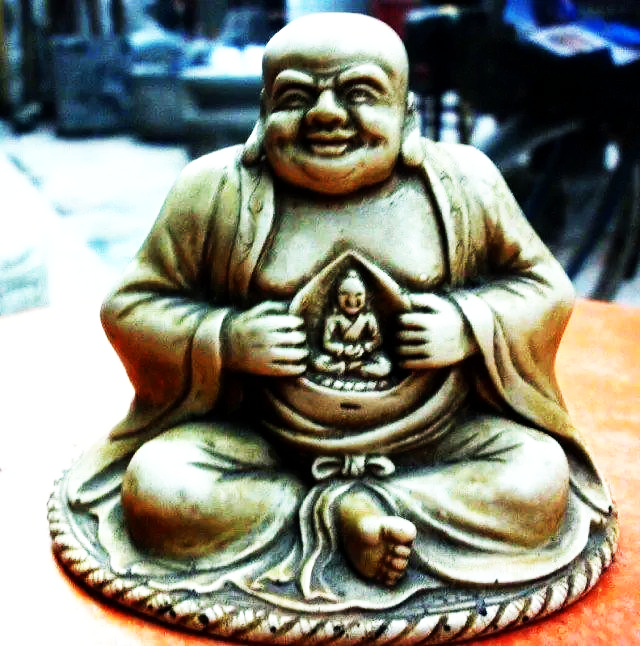 This should come as no surprise since he was required to take the tonsure as a Buddhist monk. Modern depictions often deviate from the features mentioned here (more on this below). Fig. 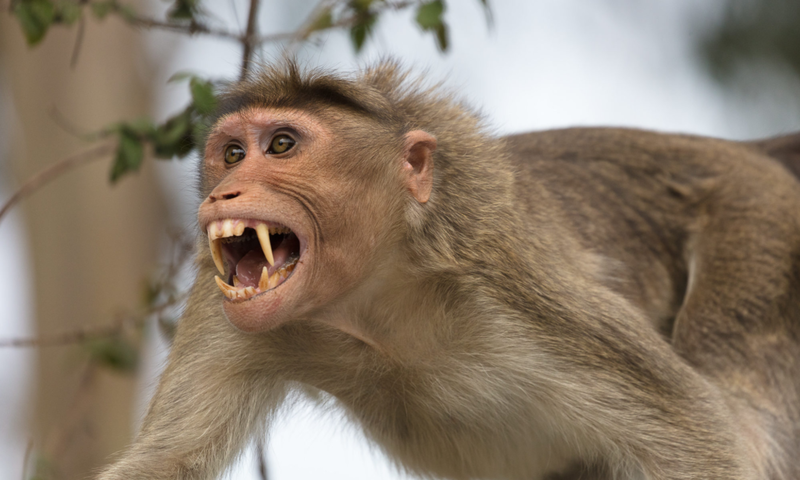 8 – A Bonnet macaque bearing its teeth (larger version). Photo by Hank Christensen. The furry, joweless face, broken (flat) nose, beak-like mouth with protruding fangs, and forked ears are easily discernible. Fig. 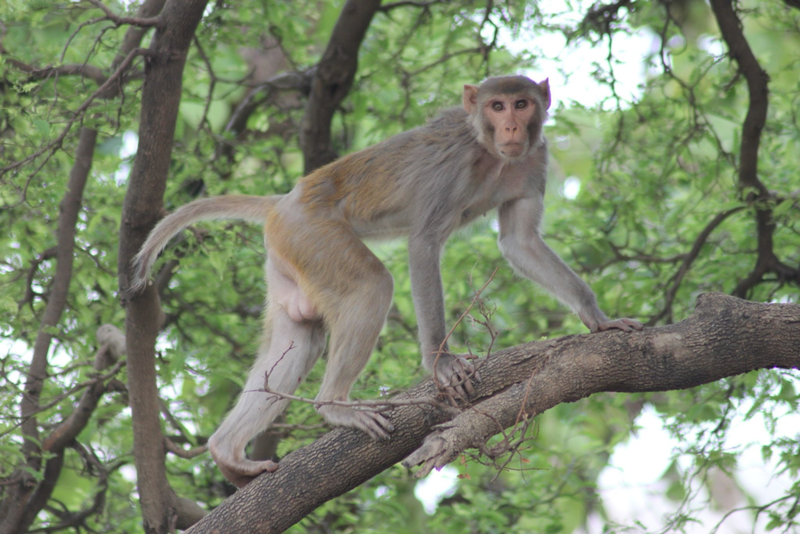 9 – The short, skinny body of a Rhesus monkey (larger version). 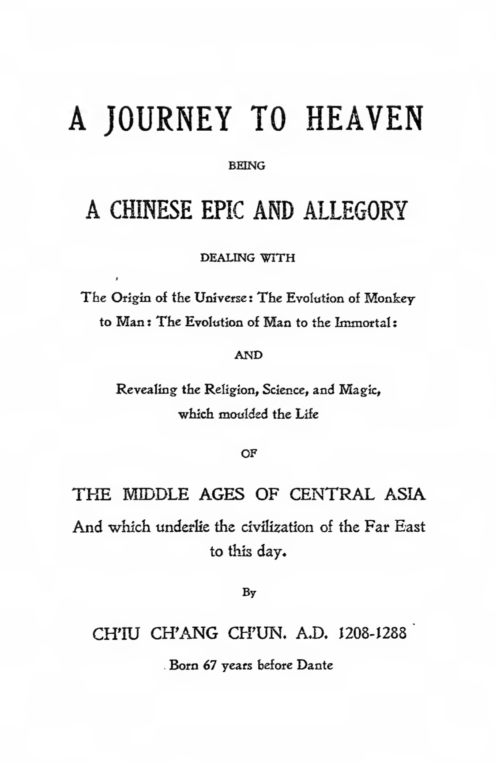 The novel mentions Sun Wukong wearing different attire throughout his roughly 900 years of life. Here I will focus on that which is closely associated with his traditional iconography. “I have here a pair of cloud-treading shoes [bu yun lu, 步雲履] the color of lotus root[, said Aoshun, the Dragon King of the Northern Ocean]. Aorun, the Dragon King of the Western Ocean said, “I brought along a cuirass of chainmail made of yellow gold [Suozi huangjin jia, 鎖子黃金甲].” “And I have a cap with erect phoenix plumes, made of red gold [ding fengchi zijin guan, 頂鳳翅紫金冠],” said Aoqin, the Dragon King of the Southern Ocean (Wu & Yu, 2012, vol. 1, p. 137). I’ve previously suggested this armor was directly influenced by that worn in Chinese opera, an artistic medium that presented popular events from the Journey to the West story cycle long before the novel was published. The use of such garb highlights Monkey’s status as a cultural hero. People wanting to replicate his armor should take cues from the operatic examples (fig 10). 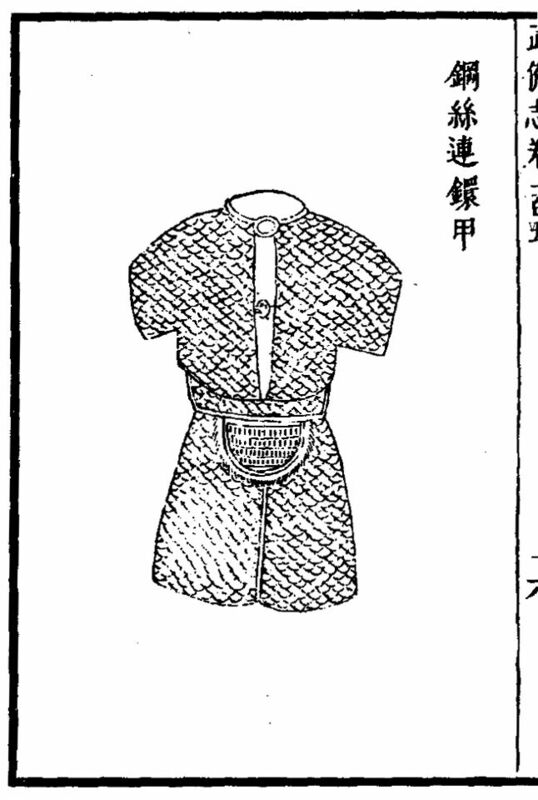 Otherwise, they could try replicating Ming-period chainmail (fig. 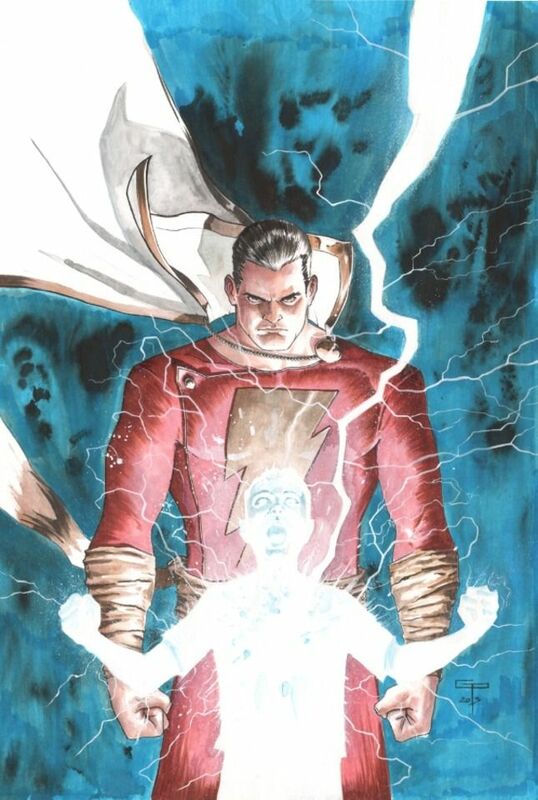 11) for more authenticity, but it’s not nearly as flashy. Fig. 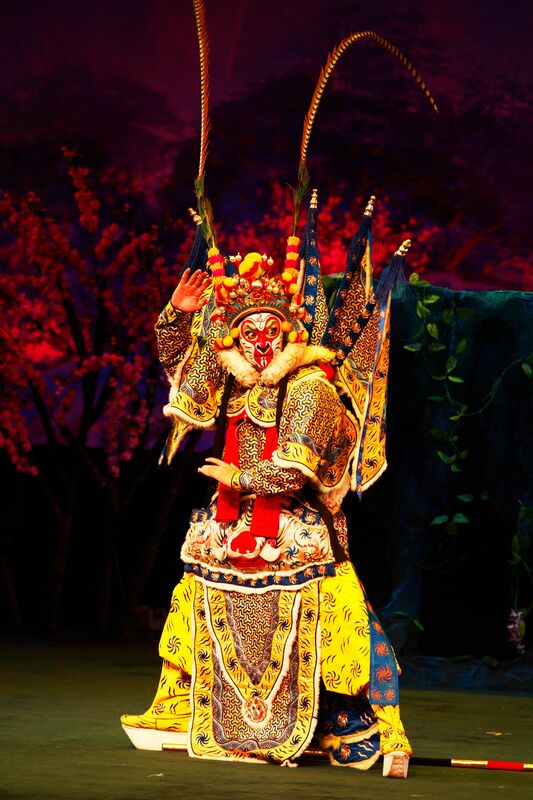 10 – Monkey as portrayed in Beijing Opera (larger version). This armor is shown with the Mountain Pattern. Fig. 11 – Ming Chainmail from the Wubei zhi (1621) (larger version). Most importantly, after being released from his 500-year-long imprisonment under Five Elements Mountain, Monkey is expressly described as being “stark naked” (chi tiao tiao, 赤條條) (Wu & Yu, 2012, vol. 1, p. 309). [Slit] the skin straight down, he then ripped it off in one piece. He chopped away the paws and the head, cutting the skin into one square piece … He cut it again into two pieces; he put one of these away and wrapped the other around his waist. Ripping off a strand of rattan from the side of the road, he firmly tied on this covering for the lower part of his body (Wu & Yu, 2012, vol. 1, p. 310). Fig. 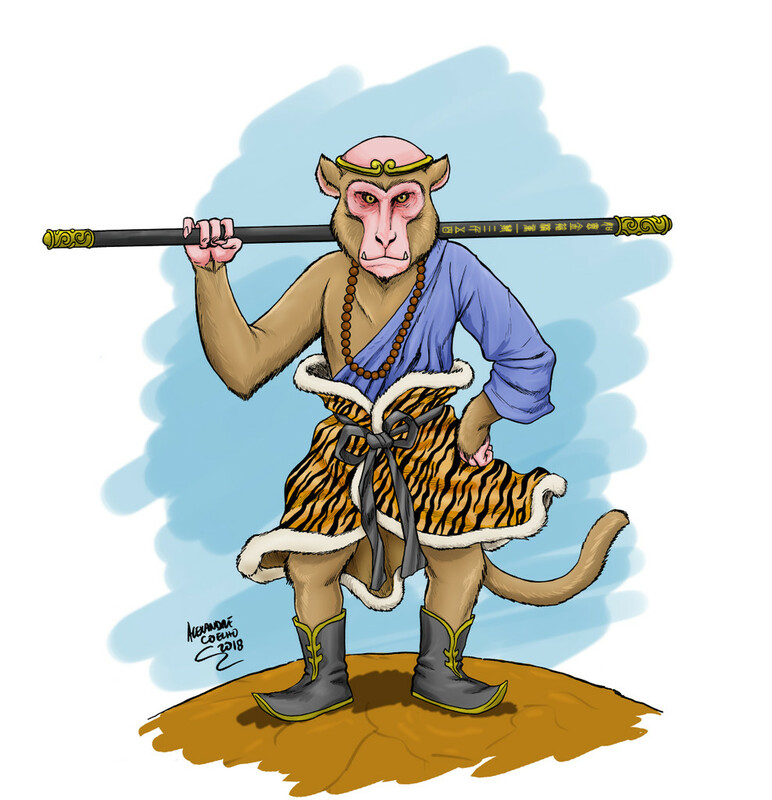 12 – A modern depiction of Sun Wukong with a tiger skin kilt (larger version). By the author. 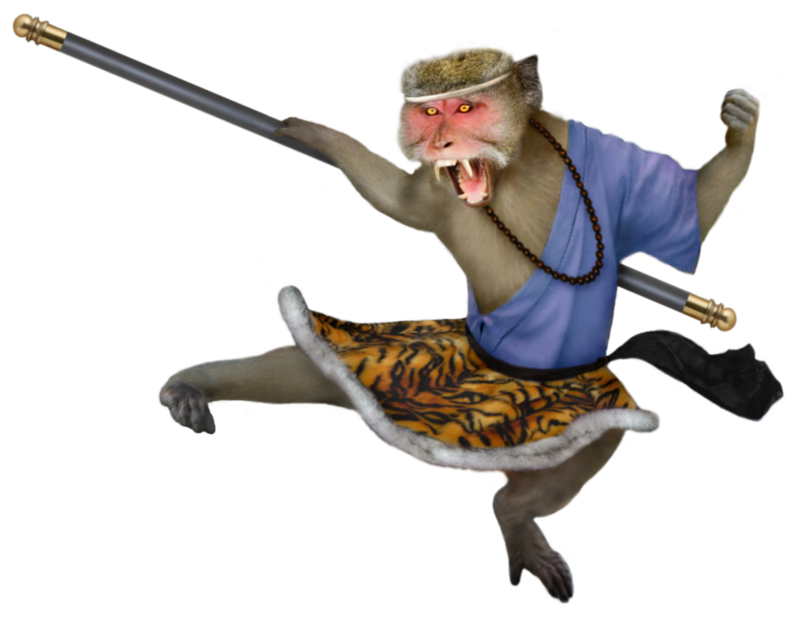 Monkey’s most recognizable accessory is the self-control-inducing golden fillet (jingu quan, 金箍圈), which he is tricked into wearing as a punishment shortly after murdering six bandits in chapter 14. 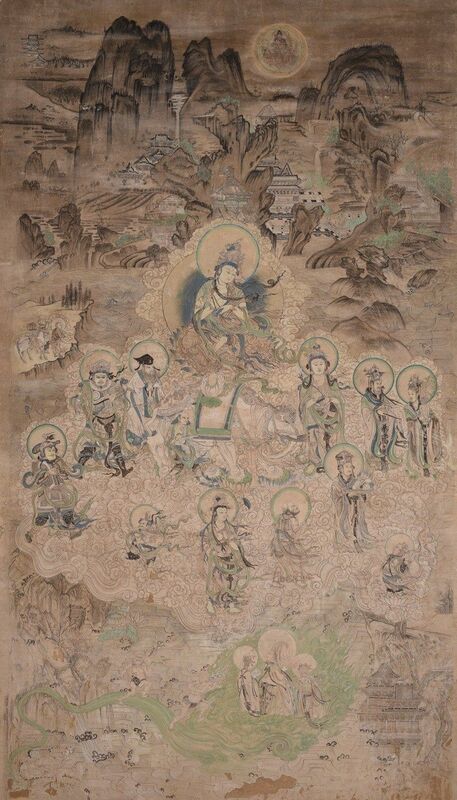 As noted above, the band predates the novel, appearing in the 11th-century Eastern Thousand Buddha Cave number two painting. This piece depicts the headgear as a simple circlet devoid of any decoration (fig. 13). This matches the novel’s description of “a thin metal band” (jinxian, 金線) (Wu & Yu, 2012, vol. 1, p. 310). But as can be seen from the Kaiyuan temple pagoda relief, there also exists a version with blunt ends that meet in the middle of the forehead and curl upwards (fig. 14). This has come to be the most popular version used in modern media. Fig. 13 – Detail of Sun Wukong’s fillet from Eastern Thousand Buddha Cave no. 2 (c. 11th-cent.). Picture enhanced slightly for clarity. Fig. 14 – Detail from the Kaiyuan Temple pagoda relief (c. 1237) (larger version). His looks were exactly the same as those of the Great Sage: he, too, had a gold fillet clamped to his brownish hair, a pair of fiery eyes with diamond pupils, a silk shirt on his body, a tiger kilt tied around his waist, a golden-hooped iron rod in one of his hands, and a pair of deerskin boots [jipi xue, 麂皮靴] on his feet (Wu & Yu, 2012, vol. 3, p. 105). This appears to be the most detailed description of Monkey’s everyday clothing. It is similar to later Japanese depictions. 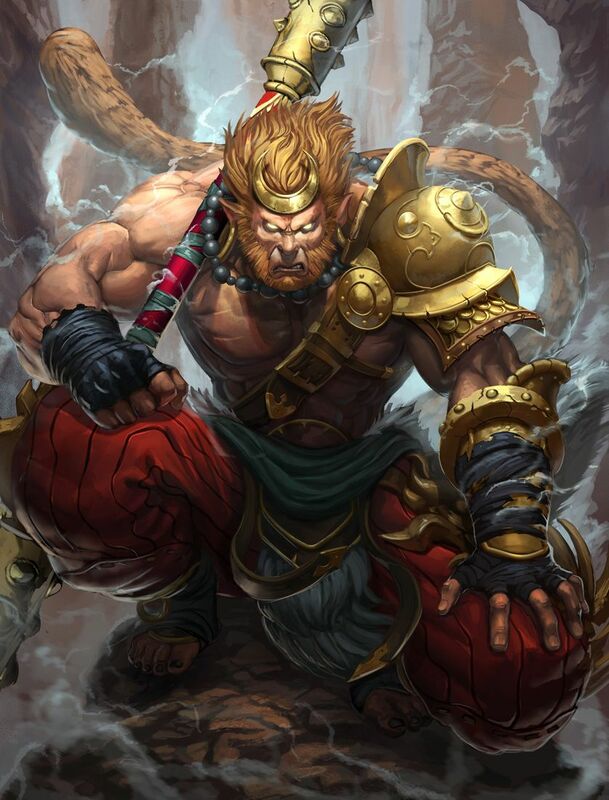 There is a distinct order in which Sun Wukong wears the aforementioned clothing and accessories: the armor, then the tiger skin, and then the golden fillet. 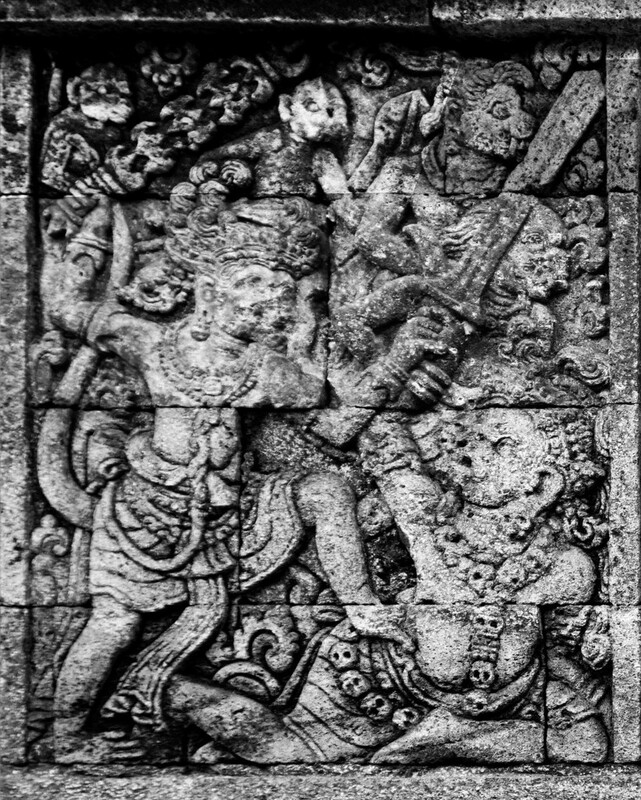 However, many modern depictions portray Monkey wearing both the armor and headband. This is obviously anachronistic within the novel’s fictional storyline. Furthermore, many depictions dismiss the tiger skin kilt altogether. So we see the staff is depicted as a rod of black iron/steel adorned on both ends with a single golden ring and decorated along the body with astronomical charts and an inscription towards one tip listing the weapon’s name and weight. The literary description greatly differs from modern media which often portrays it as entirely gold or red in color. Those wishing to replicate the inscription on the staff can use figure 15 as a template. The characters are presented in “Small Seal Script” (小篆), which hails from the Qin Dynasty (221-206 BCE) when written Chinese was standardized by Qin Shihuang. Using this will give the staff a more ancient look. I used the template years ago to create a replica staff for an archaeology course in college. Fig. 15 – The small script template for Monkey’s staff (larger version). As for “the tracks of stars and planets”, I recommend using the Dunhuang or Suchow star charts. The following two sections include a small sampling of what I consider to be the least and most accurate portrayals in modern media. These are presented in no particular order. 1) SMITE video game – He’s basically a bodybuilder with mutton chops. The design includes the aforementioned headband plus armor anachronism. Why is he wearing a gladiator-style pauldron? The original illustration is by Brolo on deviantart. 3) The Forbidden Kingdom (2008) – Jet Li has a blond ponytail, mutton chops, and a soul patch. Need I say more? 1) Yoshitoshi (1839-1892) – This Japanese artist produced many woodblock prints of our hero. Take for example his Modern Journey to the West series completed between 1864 and 1865. 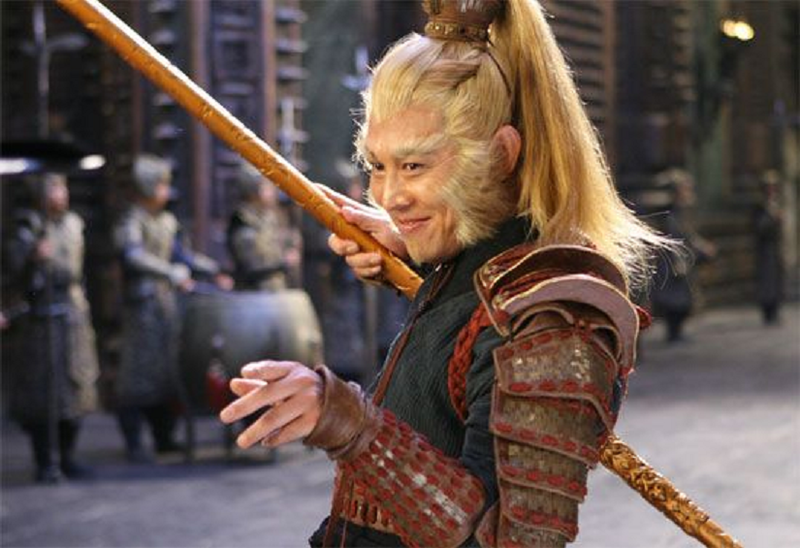 He portrays Sun Wukong as a red-faced snow macaque, which aligns more with the literary description. 2) Journey to the West: Conquering the Demons (2013) – This dark comedy depicts the Great Sage as a short, ugly primate wearing golden armor. 3) Journey to the West (2011) – This television series is a faithful adaptation of the novel. 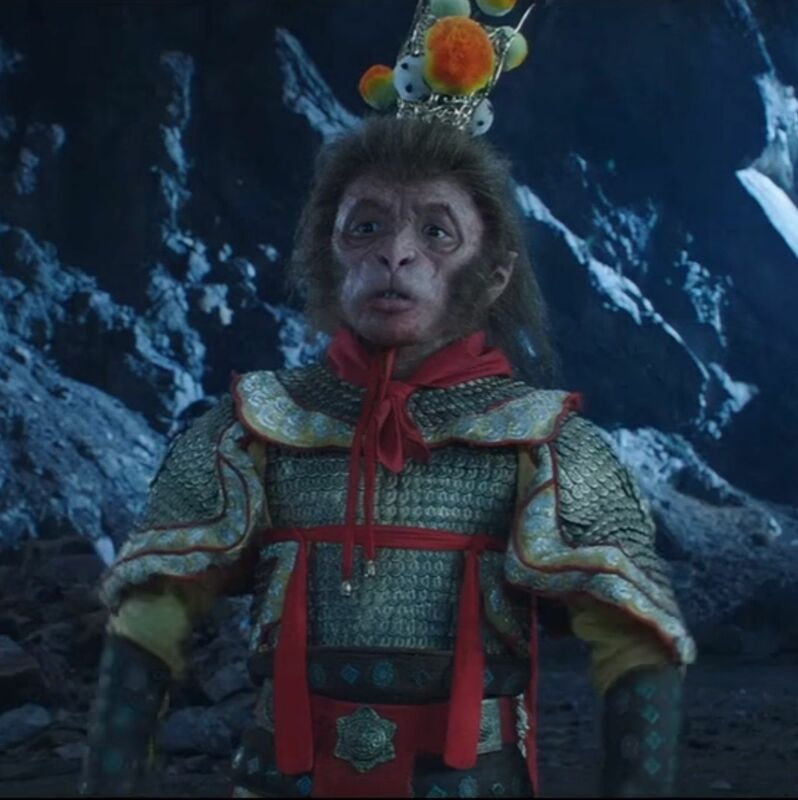 Although the actor who plays Sun Wukong is normal height, he wears a full silicone mask and clawed gloves to give the character a more primate look. His golden chainmail armor and staff are more accurate too. The latter even includes decorations on the shaft. 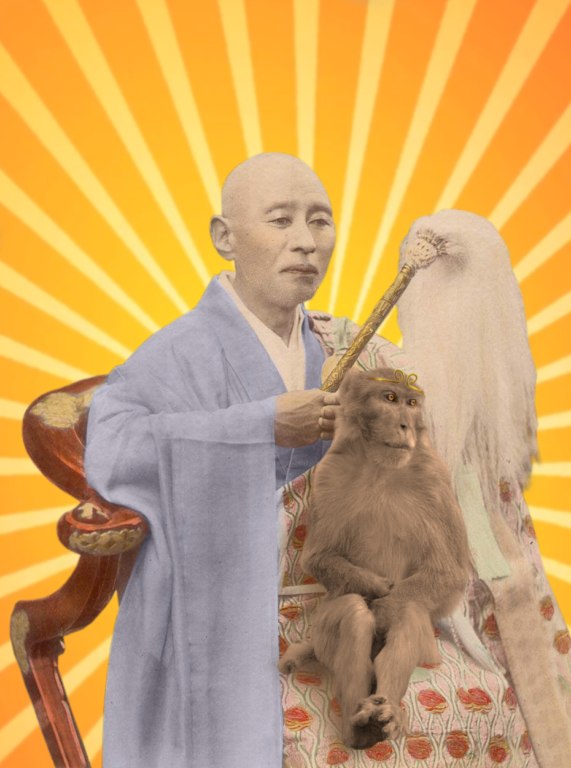 The novel portrays Sun Wukong as an ugly, bald Rhesus monkey less than four feet tall. His traditional literary attire includes a phoenix feather cap, golden chainmail armor, and lotus root-colored boots. Later, he wears a golden fillet, a silk shirt, a tiger skin kilt, and leather boots. He wields a rod of black iron/steel adorned on both ends with a single golden ring and decorated along the body with astronomical charts and an inscription towards one tip listing the weapon’s name and weight. I have written this article in the hopes that it will serve as a resource for artists and cosplayers looking to make more authentic designs. Someone may remark: “Why bother? 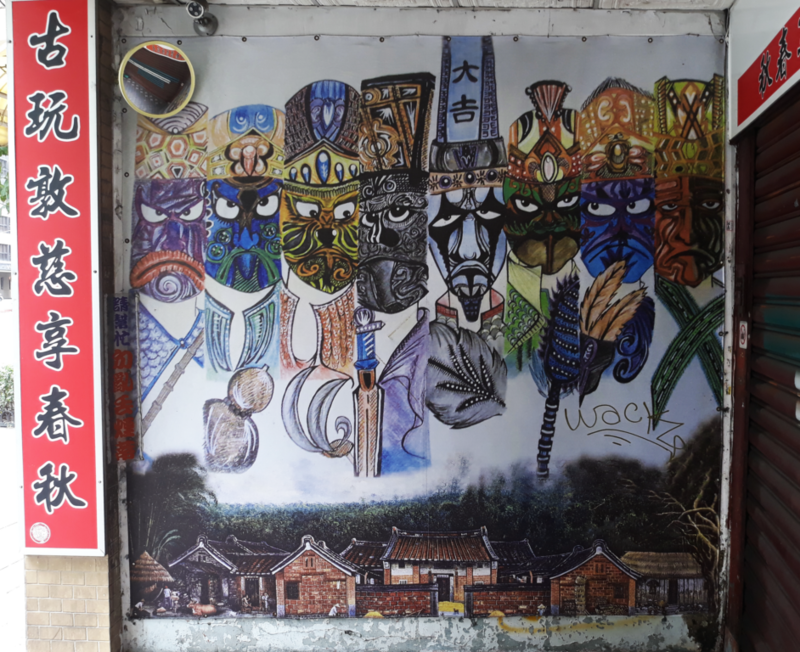 Monkey is a fictional character, so he can take any shape the artist desires.” My reply would be that all such characters have a prescribed iconography, otherwise they are not recognizable. It would be like drawing Harry Potter without the glasses and the scar, and then continuing to change lots of other stuff. At some point it’s no longer Mr. Potter but a completely different character altogether. Artist Alexandre Palheta Coelho (instagram and deviantart) has drawn a novel accurate depiction of Sun Wukong based on the above information. As can be seen, it differs greatly from that usually portrayed in modern media. 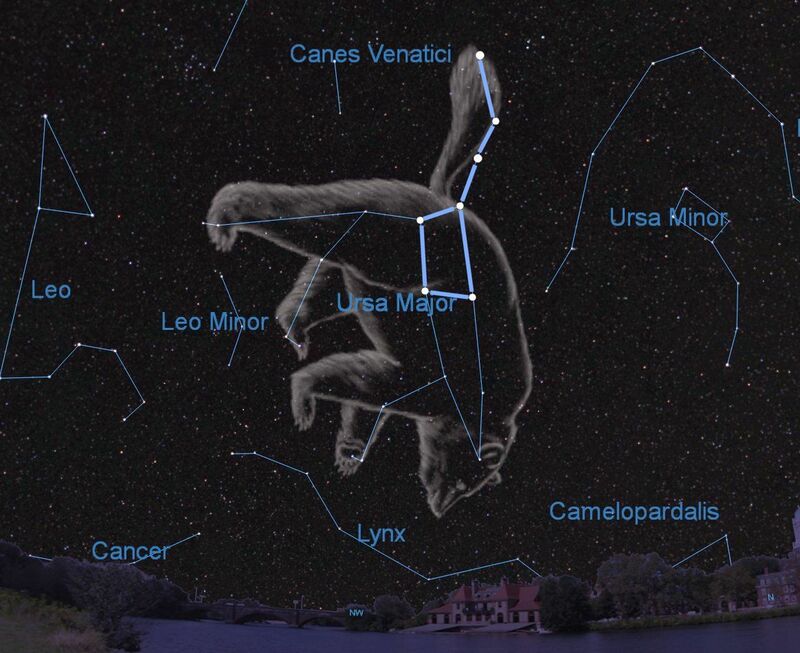 Take note of the small stature, the bald head, and especially the primate features. Recent movies and TV shows have portrayed Monkey as a young, handsome human in order to make him a love interest. History is not on the side of such depictions. As mentioned above, stories of Sun Wukong’s ugliness have spanned the centuries. 1) The 15th-century zaju play Journey to the West contains many familiar episodes that would come to appear in the final novel. 2) See the introduction of Dudbridge (1970), for example. 3) Source altered slightly. The original quote states, “…you do resemble a pignolia-eating monkey (husun)” (Wu & Yu, 2012, p. 115). 4) Anthony Yu’s original translation says “13,500 pounds”. However, the Chinese version uses jin (斤), known in English as “catty.” The catty and pound are two different measures of weight, the former being heavier than the latter. Therefore, the English text has been altered to show this. The catty during the Ming Dynasty when the novel was compiled equaled 590 grams (Elvin, 2004, p. 491 n. 133), so 13,500 catties would equal 17,550 lbs. 5) The substance bin tie (鑌鐵), also known as Bin iron, was a high quality steel imported to China from Persia. The Yuan Dynasty government set up an office named after the material and possibly catered to elite blacksmiths (Sen, 2017, pp. 104-105). Burton, F. D. (2005). Monkey King in China: basis for a conservation policy? In Fuentes, A., & Wolfe, L. D. (Eds. ), Primates face to face: Conservation implications of human-nonhuman primate interconnections (pp. 137-162). Cambridge: Cambridge University Press. Elvin, M. 2004. The Retreat of the Elephants: An Environmental History of China. New Haven (Conn.): Yale university press. Sen, T. (2017). India, China, and the World: A connected history. Lanham: Rowman & Littlefield. Wu, C., & Yu, A. C. (2012). The journey to the West: Vol. 1-4. Chicago, Illinois : University of Chicago Press.